Cake Decorating 3 Airbrush Kit with G25, G70, E91 Master Airbrushes, Master Compressor TC-20LF, 12 Color Chefmaster Food Coloring Set. Master Airbrush Models: G25 Gravity Feed, G70 Trigger Gravity Feed, E91 Siphon Feed and a High Performance Master TC-20 Professional Air Compressor. Includes 12 Color Chefmaster Food Coloring Set in. Also includes a Free Airbrush Holder, Set of Airbrush Cleaning Brushes, Hose Splitter and a How-To-Airbrush Guide Booklet. Has everything you will need to get started! Perfect for Bakeries or for Private Use. Master Airbrush Model G25 Airbrush Set. Master performance multi-purpose precision dual-action gravity feed airbrush with a 1/16 oz. Gravity fluid cup and a 0.2 mm needle & nozzle that allows you to spray from hairline up to 1 wide patterns. Master Airbrush Model G70 Airbrush Set. Master economy universal precision trigger style gravity feed airbrush with a 0.3mm tip and a 3/4 oz gravity fluid cup and an 1/8" air inlet that allows you to spray up to 2" wide patterns. 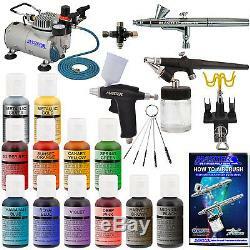 Master Airbrush Model E91 Airbrush Set. Single-action external mix siphon feed airbrush set with a 0.8mm tip, 2 - 3/4 oz. Master Airbrush Air Compressor Model TC-20. Professional high performance single-piston airbrush air compressor with air pressure regulator with gauge & water trap filter. 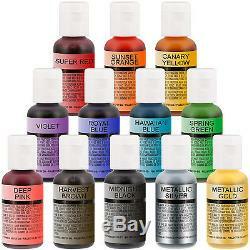 12 Color Chefmaster Airbrush Food Coloring Set. 12 of the most popular airbrush colors in. 7 fl ounce bottles: Midnight Black, Super Red, Deep Pink, Sunset Orange, Canary Yellow, Spring Green, Hawaiian Blue, Royal Blue, Violet, Harvest Brown, Metallic Gold, Metallic Silver. Free Airbrush Holder that holds up to 4 airbrushes. 6 Foot Braided Air Hose with 1/8 Fittings. 3-Way Airbrush Air Hose Splitter Manifold: Connect multiple air hoses. 5 Piece Mini Cleaning Brush Set: Ideal for cleaning small airbrush passages. How-To-Airbrush Manual & Guide Booklet by Master Airbrush. Chefmaster Airbrush Colors are the ideal, edible spray-on food coloring for use with any level of cake decorator. Chefmaster products have been the preferred choice by master decorators for over 50 years. Chefmaster Airbrush Food Colors Features & Benefits. Chefmaster Airbrush Colors are highly concentrated edible airbrush food colors with superior strength and are the brightest and truest colors available. Colors come in sealed bottles with easy-to-use flip-top or twist-top dispenser bottles. Achieve an endless spectrum of magnificent colors with these intermixable airbrush colors. Perfect for use on cakes, gum paste, fondant, pastries, sugar paste, icing, isomalt, and more. All the Chefmaster colors are made in the USA with high quality FDA approved ingredients, and are Certified Kosher. San Diego, California South Carolina. The item "Deluxe 3 Airbrush Cake Decorating Kit Air Compressor 12 Food Coloring Set Holder" is in sale since Tuesday, February 28, 2017. This item is in the category "Crafts\Art Supplies\Painting Supplies\Airbrushing Supplies\Systems & Sets". The seller is "tcpglobal" and is located in Duncan, South Carolina. This item can be shipped worldwide.